Plot: A young girl is transported into a magical world of gingerbread soldiers and an army of mice. Starring: Keira Knightley, Mackenzie Foy, Matthew Macfadyen, Morgan Freeman. 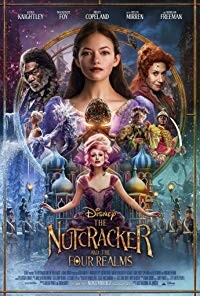 distributed by Buena Vista «The Nutcracker and the Four Realms» in the US movie theaters released on November 2, 2018 and has grossed over $161 million worldwide; dvd and blu-ray release date was set for January 29, 2019. Rent from Netflix and Redbox from February 1, 2019. «The Nutcracker and the Four Realms» in the UK released in movie theaters on November 2, 2018. The movie released on dvd and blu-ray on March 11, 2019.